Every once in a while, I read an action-mystery novel. Then I’m reminded why I don’t read them much anymore. 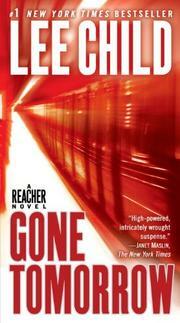 Lee Child’s Gone Tomorrow: A Reacher Novel is my latest reminder. I bought it the afternoon of April 4 while waiting for a flight home; I finished it later that evening (or maybe about 15 minutes into the next day). Gone Tomorrow follows Child’s typical formula: Jack Reacher, while minding his own business, gets sucked into a situation requiring his unique abilities: telling time without a watch, owning only one set of clothing which he never launders, rarely bathing, and apparently never using deodorant. You might think I’m being unfair but I disagree — Reacher’s clothing and hygiene habits are so important that Child’s books document Reacher’s every clothing purchase and shower. Reacher possesses nearly superhuman powers of observation, analysis, and combat. Taking on entire teams of baddies singlehandedly is Reacher’s M.O. Of course, Reacher is not the only prime specimen in Child’s books; his villains and helpful cohorts tend to include young, attractive and fit females (yeah, some are even attracted to Reacher, go figure…) and Gone Tomorrow is no exception. Even if you can overlook Reacher’s idiosyncrasies and exaggerated capabilities, you’ll have to endure a plot where, [Spoiler alert. Click to read.] at the climax, the villain throws down her gun, choosing instead to fight Reacher with a knife. This, after she saw him take down her entire security force. I’ll let you guess whether Child’s franchise ends with this book. It does for me.